Program TRC_PLAS transforms track irregularities expressed in Cartesian coordinates into a registration as if it was created by a Plasser&Theurer or Matisa track measuring vehicle. The input data file is read in free format, but the columns in the file shall have the same contents as in a trac-file. The output data file is written in mauz-format. The user also has the possibility to add designed curves to the track irregularities. Program TRC_PLAS is very similar to program TRC_MAUZ, the only difference is that Plasser&Theurer and Matisa measures both vertical and lateral track irregularities by only 3 rollers. However the middle axle of the 3 rollers can have an asymmetric location between the outer axles, in order to avoid zeros in the transfer function of the measuring vehicle. 'A' If the A-end of the track measuring vehicle is leading. 'B' If the B-end of the track measuring vehicle is leading. Vector describing the distances between the different axles in the measuring vehicle. The verical versine is measured by the axles #1, #2 and #3. The twist is measured by the axles #4 and #5. The cant is shown by axle #6. The gauge is measured by axle #7. Axle #8 is unused. The lateral versine is measured by the axles #9, #10 and #11. The file is read in free format. The columns in the file shall have the same contents as in a TRAC-file. Print of the measuring car registration to standard output. Longitudinal coordinate from where the translation will start. Length of track section to be transformed. Designed track curvature geometry to be added to the track irregularities read from file INFIL. Designed track cant geometry to be added to the track irregularities read from file INFIL. Scale factor for vertical level, right rail, when writing the filtered registration of the track measuring vehicle to file UTFIL. Scale factor for vertical level, left rail, when writing the filtered registration of the track measuring vehicle to file UTFIL. Scale factor for lateral versine, right rail, when writing the filtered registration of the track measuring vehicle to file UTFIL. 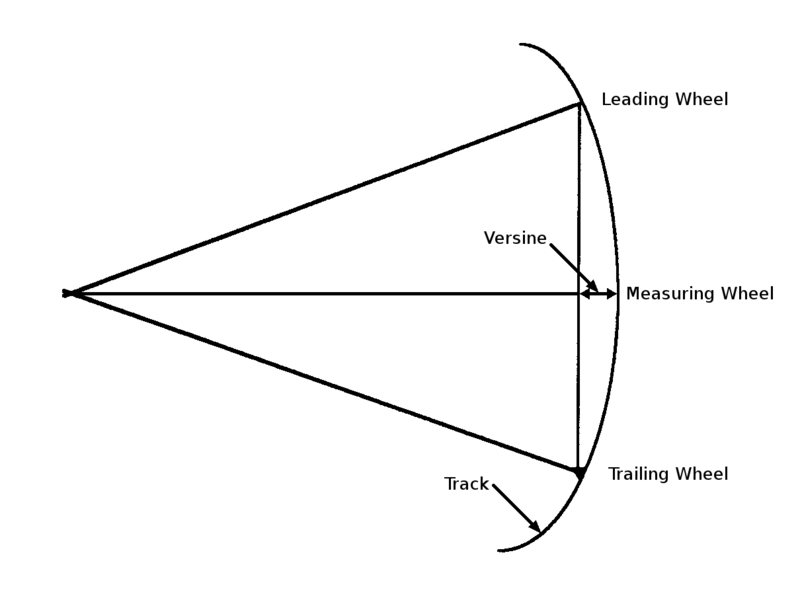 Scale factor for lateral versine, left rail, when writing the filtered registration of the track measuring vehicle to file UTFIL. Scale factor for column 3, cant unevenness, when writing the filtered registration of the track measuring vehicle to file UTFIL. Scale factor for column 4, twist, when writing the filtered registration of the track measuring vehicle to file UTFIL. Scale factor for column 7, gauge, when writing the filtered registration of the track measuring vehicle to file UTFIL. SFZH = 1., SFZV = 1., SFFI  = 1., SFC = 1., SFYH = 1., SFYV = 1., SFSPV = 1.